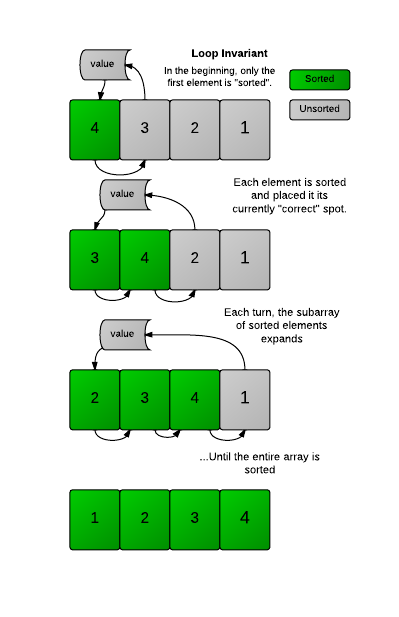 In the previous challenge, you wrote code to perform an Insertion Sort on an unsorted array. But how would you prove that the code is correct? I.e. how do you show that for any input your code will provide the right output? Initialization: It is true (in a limited sense) before the loop runs. Maintenance: If it's true before an iteration of a loop, it remains true before the next iteration. Termination: It will terminate in a useful way once it is finished. At the start of every iteration of the outer loop (indexed with ), the subarray until consists of the original elements that were there, but in sorted order. Termination - The code will terminate after has reached the last element in the array, which means the sorted subarray has expanded to encompass the entire array. The array is now fully sorted. You can often use a similar process to demonstrate the correctness of many algorithms. You can see these notes for more information. In the InsertionSort code below, there is an error. Can you fix it? Print the array only once, when it is fully sorted. Output the numbers in order, space-separated on one line. The corrected code returns the sorted array.